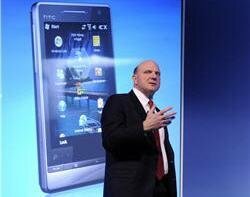 Both companies have been losing market share to iPhone and Android in the lucrative smartphone market. According to Gartner, Microsoft's share of the mobile operating system market halved from 8.7% to 4.2%, while Nokia's share of the handset market fell from 36.4% to 28.9%. Nokia expects the mobile device market to grow, driven by smartphone sales, but for margins to shrink due to competition. It declined to provide future guidance because of the uncertainties that result from the announcement, but said it expects 2011 and 2012 to be transition years, as the company invests to build the planned winning ecosystem with Microsoft. After that it expects devices and services net sales to grow faster than the market and operating margin to be 10% or more.